The image of George Washington appears in numerous forms, found on currency (shown here on the $1 bill), statues, monuments, postage and in textbooks. George Washington (February 22, 1732 – December 14, 1799) commanded the American Revolutionary War (1775–1783), and was the first President of the United States, from 1789 to 1797. In terms of personality, a leading biographer Douglas Southall Freeman concluded, "the great big thing stamped across that man is character." By character, says David Hackett Fischer "Freeman meant integrity, self-discipline, courage, absolute honesty, resolve, and decision, but also forbearance, decency, and respect for others." Because of his central role in the founding of the United States, Washington is often called the "Father of his Country" (Latin: Pater Patriae). His devotion to republicanism and civic virtue made him an exemplary figure among early American politicians. His image has become an icon and is commonplace in American culture. ✪ Is It Time for George Washington University to Change Its Name? First in war, first in peace, and first in the hearts of his countrymen, he was second to none in humble and enduring scenes of private life. Pious, just, humane, temperate, and sincere; uniform, dignified, and commanding; his example was as edifying to all around him as were the effects of that example lasting. ... Correct throughout, vice shuddered in his presence and virtue always felt his fostering hand. The purity of his private character gave effulgence to his public virtues. ... Such was the man for whom our nation mourns. Lee's words set the standard by which Washington's overwhelming reputation was impressed upon the American memory. Washington set many precedents for the national government and the presidency in particular. In 1951 the unwritten two-term limit set by Washington would become the 22nd Amendment to the Constitution. He also set constitutional precedent by being the first president to use the Presidential Veto. West told me that [in 1781]....The King began to talk abt. America. He asked West what would Washington do were America to be declared independent. West said He believed He would retire to a private situation. -- The King said if He did He would be the greatest man in the world. Washington was long considered not just a military and revolutionary hero, but a man of great personal integrity, with a deeply held sense of duty, honor and patriotism. He was upheld as a shining example in schoolbooks and lessons: as courageous and farsighted, holding the Continental Army together through eight hard years of war and numerous privations, sometimes by sheer force of will; and as restrained: at war's end taking affront at the notion he should be King; and after two terms as President, stepping aside. My fine crab-tree walking stick, with a gold head curiously wrought in the form of the cap of liberty, I give to my friend, and the friend of mankind, General Washington. If it were a Sceptre, he has merited it, and would become it. Washington was always the exemplar of republican virtue in America. He is seen more as a character model than war hero or founding father. One of Washington's greatest achievements, in terms of republican values, was refraining from taking more power than was due. He was conscientious of maintaining a good reputation by avoiding political intrigue. He had no interest in nepotism or cronyism, rejecting, for example, a military promotion during the war for his deserving cousin William Washington lest it be regarded as favoritism. Thomas Jefferson wrote, "The moderation and virtue of a single character probably prevented this Revolution from being closed, as most others have been, by a subversion of that liberty it was intended to establish." Washington was the leading figure during the American Revolution. Though he had been the highest-ranking officer of the Revolutionary War, having in 1798 been appointed a Lieutenant General (now three stars), it seemed, somewhat incongruously, that all later full four star and higher generals were considered to outrank Washington. This issue was resolved in the bicentennial year of 1976 when Washington was, by act of Congress, posthumously promoted to the rank of General of the Armies, this promotion being backdated to July 4, 1976, making Washington permanently the senior military officer of the United States. Washington was the first American president under the United States Constitution,[a] and was unanimously elected by the Electoral College in 1789 and again in 1792; he remains the only president to receive the totality of electoral votes. The system in place at the time dictated that each elector cast two votes, with the winner becoming president, and the runner-up vice president. All electors in the elections of 1789 and 1792 cast one of their votes for Washington; thus it may be said that he was elected president unanimously, which has become his legacy alone. This 19th-century engraving is a depiction of Washington supervising his slaves at Mount Vernon. The survival of the United States in large part depended on the actions of George Washington, the dynamic leader in the American Revolution and the country's first President. Washington believed that the institution of slavery on its own would eventually die out and be replaced by an industrial revolution that was beginning to emerge in the Northern states. Prior to the American Revolution, Washington never displayed any animosity towards slavery. His views on slavery were modified during the Revolution, between 1775 and 1784, having been influenced by the egalitarian belief that men were born with natural rights. Washington also discovered during the Revolution that free blacks who served in the Revolutionary Army could match the industry, dedication, and courage exhibited by white soldiers. In 1794, while President, to resolve his dilemma over slavery, Washington attempted to lease property at Mount Vernon to English farmers on the condition that former slaves would work as paid free laborers. This idea had been postulated to Washington by his close friend, Marquis de Lafayette, an abolitionist, in a 1784 meeting at Mt. Vernon. However, the plan proved to be improbable and no buyers could be found to purchase the land. Although Washington himself could have freed his own slaves and paid them as workers, he never did. According to historians, his death in 1799 under his new will in essence condemned Mt. Vernon to ruin and was in effect an act of atonement for Washington's lifetime involvement in human exploitation. Martha voluntarily freed Washington's slaves in 1800, sixteen months prior to her own death. The president's Cabinet and the selection of cabinet members is also not explicitly stated in the Constitution. Washington understood the importance of receiving counsel and thus established the practice of appointing secretaries of the Executive Departments. Article II Section 2 of the Constitution gives him the power to do so and states the President, "with the advice and consent of the senate... shall appoint... all other officers of the United States." Washington's face and image are often used as national symbols of the United States, along with the icons such as the flag and great seal. 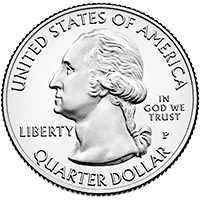 Perhaps the most pervasive commemoration of his legacy is the use of his image on the one-dollar bill and the quarter-dollar coin. Washington, together with Theodore Roosevelt, Thomas Jefferson, and Abraham Lincoln, is depicted in stone at the Mount Rushmore Memorial. Starting with victory in their Revolution, there were many proposals to build a monument to Washington. After his death, Congress authorized a suitable memorial in the national capital, but the decision was reversed when the Democratic-Republicans took control of Congress in 1801. The Democratic-Republicans were dismayed that Washington had become the symbol of the Federalist Party; furthermore, the values of Republicanism seemed hostile to the idea of building monuments to powerful men. Further political squabbling, along with the North-South division on the Civil War, blocked the completion of the Washington Monument until the late 19th century. By that time, Washington had the image of a national hero who could be celebrated by both North and South, and memorials to him were no longer controversial. Predating the obelisk on the National Mall by several decades, the first public memorial to Washington was built by the citizens of Boonsboro, Maryland, in 1827. Many things have been named in honor of Washington. George Washington is the namesake of the nation's capital, Washington, D.C., and the state of Washington, the only state to be named for a president. The Washington Monument, one of the most well-known American landmarks, was built in his honor. A variety of colleges and universities, throughout the United States, are named for George Washington. The United States Navy has named three ships after Washington. The George Washington Bridge, which extends between New York City and New Jersey, and the palm tree genus Washingtonia, are also named after him. A bronze statue of Washington stands in London at the National Gallery, a gift from the Commonwealth of Virginia. There are many other "Washington Monuments" in the United States, including two well-known equestrian statues, one in Manhattan and one in Richmond, Virginia. The first statue to show Washington on horseback was dedicated in 1856 and is located in Manhattan's Union Square. The second statue is known as either the Virginia Washington Monument or as the George Washington Equestrian Statue and was unveiled in 1858. It was the second American statue of Washington on horseback but figures prominently in the official seal of the Confederate States of America. A marble statue of Washington was made from life by sculptor Jean-Antoine Houdon, and now sits in the Rotunda of the State Capitol in Richmond, Virginia. A duplicate, one of 22 bronze exact replicas, was given to the British in 1921 by the Commonwealth of Virginia and now stands in front of the National Gallery at Trafalgar Square. Washington Square Arch (1892) in Washington Square Park, NYC, is perhaps the nation's most prominent monument celebrating the centennial of Washington's inauguration. In 1917 the 886 Washingtonia asteroid was named in his honor. Washington Inaugural Celebration, 1889, New York. Parade passing Union Square on Broadway. The image of Washington has always been commonplace on U.S. currency and postage stamps. Benjamin Franklin and George Washington: The First U.S. Postage Stamps, Issued 1847: The first stamp issues were authorized by an act of Congress and approved on March 3, 1847. Washington, along with Benjamin Franklin, appeared on the nation's first postage stamps in 1847. Since that time Washington has appeared on many postage issues, more than all other presidents combined. Washington's victory over Cornwallis at the Battle of Yorktown was commemorated with a two-cent stamp on the battle's 150th anniversary on October 19, 1931. The 150th anniversary of the signing of the Constitution with George Washington as presiding officer was celebrated with a three-cent issue on September 17, 1937, was adapted from the painting by Julius Brutus Stearns. Washington's presidential inauguration at Federal Hall in New York City was celebrated on its 150th anniversary on April 30, 1939. George Washington is featured in modern video games as a prominent fictionalized character from world history in Age of Empires III, Civilization V and Assassin's Creed III (as himself in game and a counter-history King in DLC). These games are discussed in Winnerling and Kershbaumer's Early Modernity and Video Games explaining that the player manipulating the games' semiotic system of communications thereby "gives insights in his historical consciousness." ^ Under the Articles of Confederation and Perpetual Union, the previous constitution, the Congress of the Confederation called its presiding officer the "President of the United States in Congress Assembled". The position had no executive powers, but the similarity of titles has confused some into thinking there were other presidents before Washington. ^ The rest of the Top 20 street names are all descriptive (Hill, View and so on), arboreal (Pine, Maple, etc.) or numeric (Second, Third, etc.). ^ David Hackett Fischer (2006). Washington's Crossing. Oxford UP. p. 446. ISBN 9780199756674. ^ George Washington Biography. American-Presidents.com. Retrieved on October 20, 2008. ^ The earliest known image in which Washington is identified as such is on the cover of the circa 1778 Pennsylvania German almanac (Lancaster: Gedruckt bey Francis Bailey). This identifies Washington as "Landes Vater" or Father of the Land. ^ Farington, Joseph (1922). Greig, James (ed.). The Farington Diary, vol. i. London: Hutchinson. p. 278. , entry for December 28, 1799. ^ Promotion order of George Washington, Military Personnel Records Center (Image:Orders 31-3.jpg and Image:Orders 31-3 Cover Letter.jpg). ^ Administrator. "George Washington and Executive Power". Center for Civic Education. The Mount Vernon Ladies' Association. Retrieved October 27, 2018. ^ a b c "Presidential Precedents". George Washington's Mount Vernon. The Mount Vernon Ladies' Association. Retrieved October 27, 2018. ^ Mount, Steve (January 24, 2010). "U.S. Constitution - Article 2 Section 3 - The U.S. Constitution Online - USConstitution.net". Retrieved October 27, 2018. ^ a b Kelly, Martin (September 19, 2017). "George Washington's First Cabinet". ThoughtCo. Retrieved October 27, 2018. ^ Cohen, Sheldon S. (April 1991). "Monuments to Greatness: George Dance, Charles Polhill, and Benjamin West's Design for a Memorial to George Washington". Virginia Magazine of History and Biography. 99 (2): 187–203. JSTOR 4249215. ^ Savage, Kirk (2009). Monument Wars: Washington, D.C., the National Mall, and the Transformation of the Memorial Landscape. Berkeley,Calif: Univ.of California Press. pp. 32–45. ISBN 978-0-520-25654-5. ^ "Washington Monument State Park". Annapolis, MD: Maryland Department of Natural Resources. Retrieved December 11, 2010. ^ "July 4th Marks 150th Anniversary of the Dedication Of Union Square's George Washington Monument". City of New York Parks & Recreation. 2006. Retrieved July 7, 2012. ^ a b c "The George Washington Equestrian Monument". The Virginia State Capitol History Project. Retrieved July 7, 2012. ^ a b "Virginia Washington Monument". National Park Service. Retrieved July 7, 2012. ^ "The Great Seal of the Confederacy". Home of the American Civil War. June 1, 2002. Retrieved January 18, 2011. ^ "The addition of the statue of President George Washington to the National Statuary Hall Collection". Office of the Clerk, US House of Representatives. Retrieved July 14, 2012. ^ "Houdon Statue of George Washington". The GW and Foggy Bottom Encyclopedia. December 21, 2006. Archived from the original on June 13, 2010. Retrieved August 24, 2010. ^ "Map of Washington". Worldatlas. Retrieved January 3, 2011. ^ "George Washington's 50 Guinea Draft". Philadelphia: C.V. Starr Center for the Study of the American Experience. December 23, 1782. Archived from the original on June 9, 2010. Retrieved December 17, 2011. ^ "Board of Visitors and Governors". Chestertown, Maryland: Washington College. Archived from the original on August 19, 2011. Retrieved December 17, 2011. ^ "Most Common U.S. Street Names". Washington, D.C.: National League of Cities. 2010. Retrieved January 19, 2013. ^ Andrews, E. Benjamin (1912). History of the United States. New York: Charles Scribner's Sons. ^ "U.S. Postage Stamps". Publication 100 - The United States Postal Service - An American History 1775 - 2006. USPS. May 2007. Retrieved December 29, 2011. ^ Kloetzel, James E., ed. (2009). Scott 2010 Specialized Catalogue of United States Stamps & Covers. Sidney, Ohio: Scott Pub. Co. ISBN 978-0-89487-446-8. ^ Trotter, Gordon T., Yorktown Issue, National Postal Museum online. ^ Trotter, Gordon T., [3c Constitution Sesquicentennial plate block of four Constitution Sesquicentennial Issue], National Postal Museum online. ^ Haimann, Alexander T., Washington Inauguration Issue, National Postal Museum online. ^ Winnerling, Tobias and Kershbaumer, Florian. Early Modernity and Video Games. ISBN 978-1-44-386234-9, p. 70, 106, 148, 160.